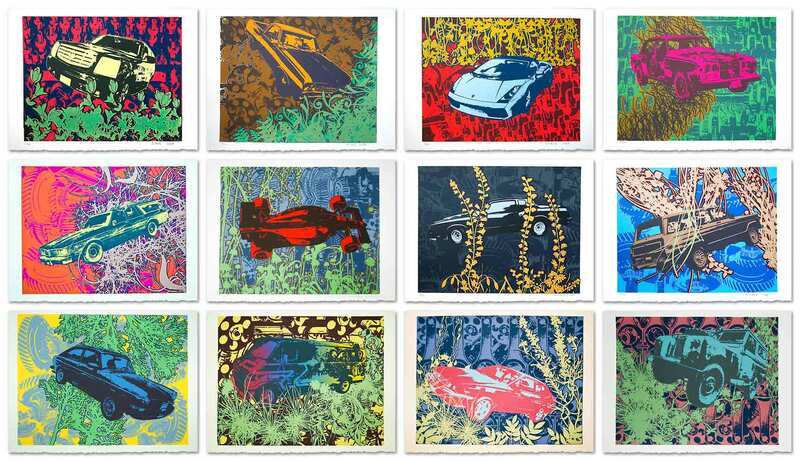 High octane art... twelve handmade, prints in one boxed edition. The Machine Overdrive series originated as a print project in 2008. The 12 colorful, vibrant silkscreen prints were created over the course of one year. The style relates to '60s pop art, with bright colors and bold shapes. The subject covers classic automobiles from the '60s through the '90s in contrast with repetitive mechanical and organic patterns. Under the glossy veneer also lingers a hint of critical social commentary. Most people can relate to the automobile in one way or another. Cars are everywhere. They appear omnipresent in peoples lives, their presence rarely questioned. Our environment is tailored to the machine and the automobile is visually fused together with whatever we see. Interested in purchasing a set? I printed a limited edition of twenty, each numbered and certified, containing twelve individual prints. The prints are sold together as a boxed edition. For more info about purchasing an exclusive set please contact info[at]machineoverdrive.com, or go to the shop to buy a Machine Overdrive exclusive set online. 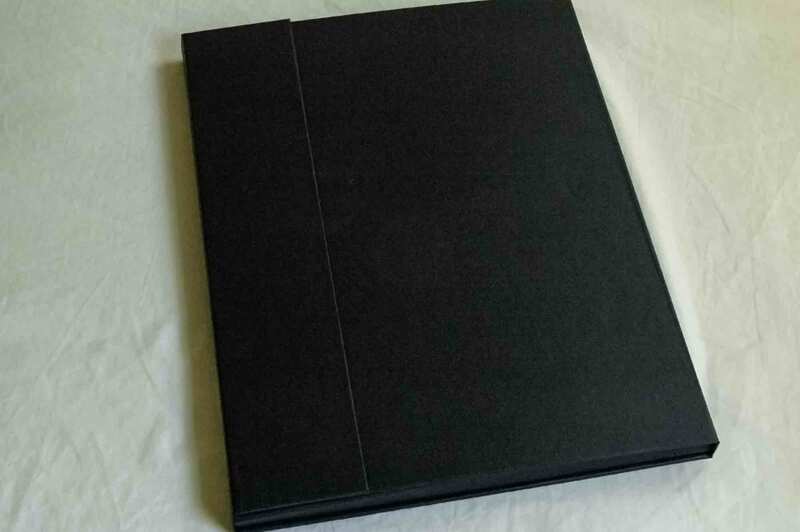 The prints come in a sturdy, elegant fold-over portfolio presentation case. The measurements of the portfolio case is 16 x 12 in (41 x 31 cm). The dimension of the prints are 15 x 11 in (38 x 28 cm). The prints are hand pulled on assorted print stock. Keep in mind that each print varies slightly. The color representation on your computer screen may not be accurate, but it gives a good idea how vibrant they appear. There also are a limited number of single special edition prints available. The prints are 15 x 11 in (38 x 28 cm) in size, and all 5 colors are hand printed on assorted print stock. 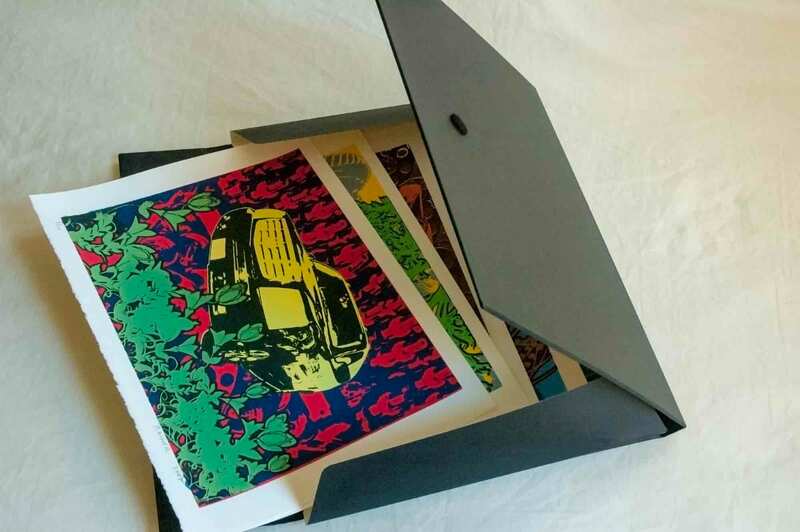 The prints are protected in this elegant 16 × 12 in (41 × 31 cm) archival box.